Today I am stocking my Writing Toolbox with a book recommendation. 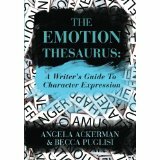 I first came across The Emotion Thesaurus: A Writer’s Guide to Character Expression when I stumbled across the authors’ website, Writers Helping Writers. This was during the days when my own author platform was being created, and I clicked on and followed anything and everything that looked as if it might be valuable. The point being: I didn’t give the book much of a glance. Of course, posts from the site kept leading me back to The Emotion Thesaurus as well as mentions on other writing blogs. I checked out the book on Amazon, and I decided I must have it. And by must have it, I mean I asked my local library to purchase it. The simplicity of the book is brilliant. Ms. Ackerman and Ms. Puglisi did a wonderful job explaining how to write emotional responses well. The book includes a long list of emotions with examples of physical signals, internal sensations, mental responses, cues of acute or long-term confidence with other emotions to which the original one may escalate, and cues of repressed desire. As well done as all of the above-mentioned features are, what I liked best about the book was the authors’ admission that their book is a launching point. The Emotion Thesaurus is meant to help each and every one of us writer better, not to copy verbatim from the list of emotional responses. This simple book gently pushes and guides one to think beyond the usual, clichéd responses. It presents one of my favorite things in writing: malleable rules. I hope you find this book as helpful as I did.